Happy New Year! It's been a little quiet around these parts but I'm determined to change that this year. I've decided to change my focus to creating more wholesome, healthier desserts. 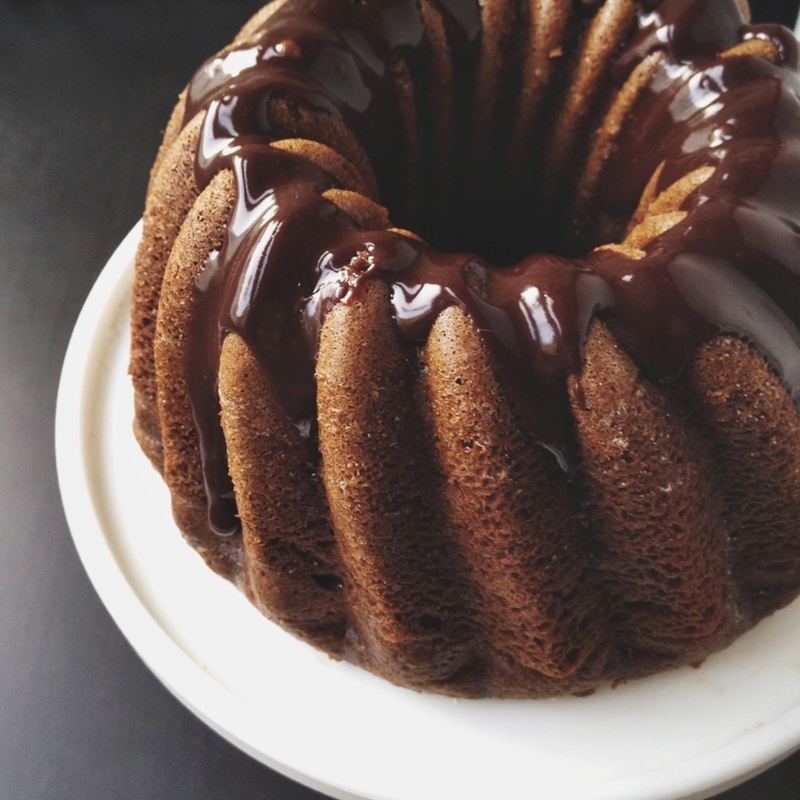 More on that soon, but in the mean time here is a ginger molasses bundt cake I tested out yesterday. I brought it to a New Year's gathering yesterday and I'm so happy to report that everyone loved it. These are family members that love cakes loaded with sugar and white flour, so I took it as quite a compliment! I was inspired to make this cake after baking sticky date pudding for Christmas. It was a total sugar bomb, made with over 2 cups of brown sugar, but totally rich and delicious for a special occasion. The recipe called for blending the dates with water, sugar and butter which I'd ever done before. I was curious (and a little worried) to see if the cake was going to come out gummy. Lo and behold it was light and fluffy! I knew I had to try the same technique with gluten free flours. I used a 3 cup bundt pan for this recipe. It's not a common size, so I tried it in a 6" cake pan as well. It had to bake slightly longer but still came out fine, so be sure to keep an eye on it. Here are two ways I decorated the cake, one with chocolate ganache and one with simple powdered sugar on top. The ganache looks much more decadent while the powdered sugar is more simple and casual. Both are equally tasty. I have tested this recipe with both butter and oil and there was no difference in the final product. A flax egg may be used, making this recipe vegan, but your results may vary. I tried this as well and it was a little too moist and borderline gummy. In a medium bowl, whisk together oat flour, baking powder, and spices. Set aside. In a separate bowl, combine the dates, water and baking soda and let sit for 5 minutes. Place the date mixture in the bowl of a food processor or blender with the oil/butter, molasses, and brown rice syrup and blend until smooth. Add the egg, then the flour mixture and process until just combined. Pour into a lightly greased 3 cup bundt pan or 6" cake pan. Bake for 30-35 minutes or until a skewer comes out clean. Add more spices if you like a more prominent flavor. My preference is 1/2 tsp ginger. You may use dried or fresh for more kick.